VMware Virtual Volumes (VVols) is an integration and management framework aimed at creating a VM-centric infrastructure in which an individual VM becomes a unit of storage management for a storage system. This technology allows administrating the underlying storage in a simple and convenient way from the hypervisor. VVols integrates into the vSphere infrastructure using VASA provider, which allows configuring StarWind Virtual SAN resources as storage containers for virtual machines and provides more efficient management of the entire environment by simplifying storage utilization. VVols simplifies the storage array management by creating individual HA LUN per each necessary VM size. 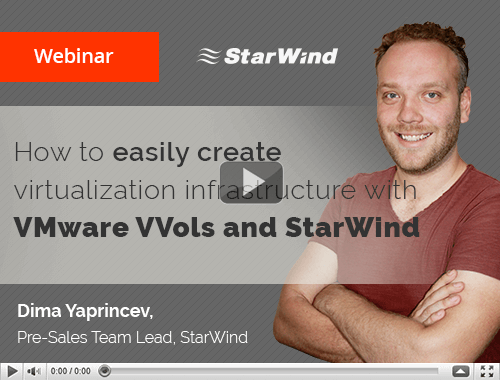 Being integrated with StarWind products, Virtual Volumes facilitates VM deployment, speed up environment configuration and increase redundancy by providing the ability to create highly available StarWind LUNs. Additionally, StarWind VVols provides such features as L1 and L2 cache, snapshots and deduplication. One of the key benefits of utilizing VVols is that no overprovisioning occurs in the storage array as only the necessary amount of space is used. There is no more need to perform multiple operations on different layers, like hypervisor or storage layer to configure an IT infrastructure from scratch since vSphere becomes a single point of administration. The video further demonstrates how to configure virtual machines on HA device with VVols.